Pro Starter is an App for athletes who want to practice starts while training. If you are training alone or each athlete wants to start at the same time, Pro Starter will be your starter. Place it on the start line and press Start. Pro Starter will call out clear commands of a normal athletic Start Sequence. The Start Sequence is: “On Your Marks”, “Set”, and pistol fire. It's easy! Place your Apple device next to you on the Start line and tap Start. 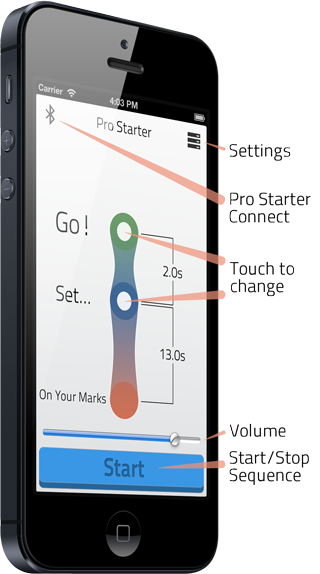 You control the timed gaps between the commands using the stretch ribbon control in the middle of the screen. Under "Settings" you can also enable “Gun Variance”. This will vary the time between “Set” and the pistol fire. The variance will help you practice for races when starters are inconsistent at competitions. Use Pro Starter Connect to enable remote starts and timing. Set the time between "On Your Marks" and "Set" to 17 seconds and "Set" to "Go" to 1.7 seconds. Set the time between "On Your Marks" and "Set" to 6 seconds and "Set" to "Go" to 1.5 seconds. Pro Starter Connect is a feature that allows you to have a “Starter” device and a “Gun” device. 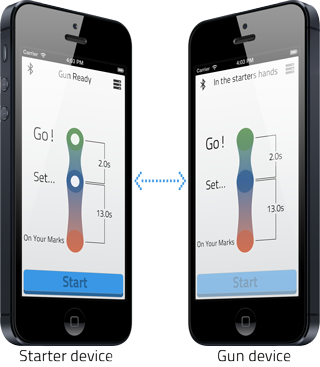 Using Bluetooth, two iOS devices can connect so that one device acts as the “Starter” and the other as the “Gun”. The “Starter” device then controls the “Gun” device, starting, resetting and stopping the Start Sequence on the “Gun” device remotely. Install Pro Starter on two compatible Apple devices (see Support below). Turn Bluetooth On, then load the Pro Starter App. In the App tap the Bluetooth icon in the top left to show the Pro Starter Connect settings screen. Then simply select which mode you want your device to be, either "Starter" or "Gun". Once you have selected a mode for your device, select the opposite mode for the other device. The Connect settings screen will hide once the two devices have connected. The “Starter” device now can remotely control the “Gun” device. Leave the “Gun” device at the start line and take the “Starter” device to the finish line. If the pistol fires on the “Gun” device the “Starter” device can record the winning athletes time. This feature is only provided on Apple devices that support Bluetooth 4 LE. Pro Starter Connect uses Bluetooth 4 LE to connect the two devices. The distance that the two devices can connect varies depending on conditions.